When Should I Adjust My Payroll Withholdings? If you have ever been employed you know that one of the first orders of business is to fill out a W-4. This federal form answers the question of “How much taxes are deducted from my paycheck?” as well as “What will my paycheck be after taxes?” The tricky part of filling out the form comes when you determine how many allowances you will claim. The more allowances you write down in the box, the less money will be withheld from you check for taxes; the less allowances you claim, the more money will be withheld. Ideally, you want to strike the right balance and break even, meaning, when April comes around you won’t owe any tax or receive a large tax refund. 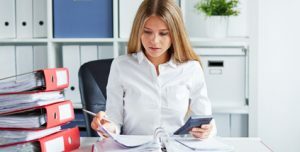 Once you have been through a tax season with your new job, you may have decided you were right on in making your educated guess determining withholding. If, however, you are like most people, you will need to make an adjustment to your W-4 throughout your employment because of career or life changes. If you get married you will most likely need to make changes to your W-4. If your spouse works then your combined withholding will most likely go up. If your spouse does not work, you may need to claim more allowances to have less withholding. Of course, all of this is also dependent on your filing status (married filing jointly or married filing separately). If you divorce, you will also likely need to make an adjustment depending on how your total income has changed, and if you are receiving or paying alimony. Each addition to your family, having a baby or adopting a child, will likely mean taking an additional allowance for a dependent on your W-4 form. You will also most likely qualify, depending on your income, for the Child Tax Credit, Child Care Credit and the federal Adoption Tax Credit for an adopted child. Keep in mind that while tax deductions lower your taxable income, tax credits provide a dollar for dollar reduction of your tax liability. Children grow quickly, and your child’s age, as well as other determining factors, may warrant a change in your W-4. If they no longer qualify as a dependent you will not only lose the exemption, but also a tax credit. This will come as an unpleasant surprise if you do not adjust your withholding before tax season. If you purchased a home you can expect some beneficial tax deductions. You may be able to write off what you paid in mortgage points in obtaining your loan in addition to the mortgage interest and property taxes. Keep in mind that the longer you pay on your loan the less you will pay in interest. Adjustments on your W-4 may need to be made throughout the life of your loan to account for the changes in your interest payment. Check out how much money you can save by adding more payments to your mortgage with this calculator. If you had a time during the year that you were unemployed you will need to account for that lost income on your W-4 when you start working again. On the other side of the spectrum, if you received a raise during the year you should adjust your W-4 to reflect the added income. Remember that extra income in the form of a second job for you or your spouse will also warrant an adjustment to your withholding so you aren’t caught off guard for a tax burden you weren’t prepared for. Life is full of employment and family changes. Adjusting your tax withholding BEFORE tax season will be well worth a few minutes of your time. To get a better idea of how payroll deductions affect take home pay, check out our tax deduction payroll calculator. Will you make any changes to your W4 next year?